Junior wanted to look more closely at the turntable, and to count the fingers on the motor. Grandad turned the turntable upside down, so that Junior could see the polepiece 'fingers' of the motor. 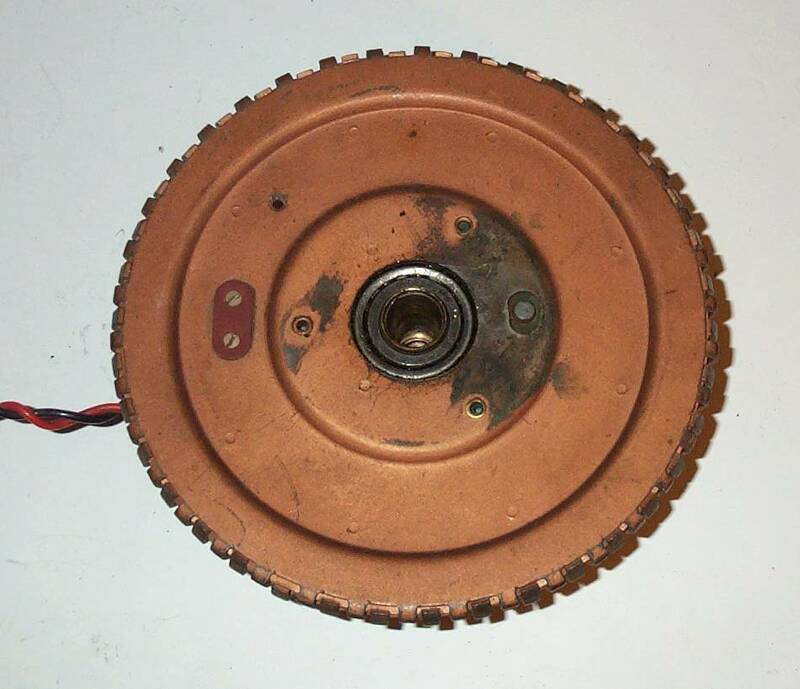 To make it easier, Grandad took away the stator, leaving just the rotor with it's spindle. Then he showed Junior the top of the stator, with the bearing in it for the spindle. Junior wanted to see the bottom of the stator, so Grandad turned it upside down. The knurled round 'nut' is used to hold the stator onto the record player case. The brass nut at the top of the picture adjusts the bearing. The polepieces are 'fingers' that are folded alternately from each side of the stator plate. This means that there must be an even number of polepieces, since it is necessary to preserve symmetry. 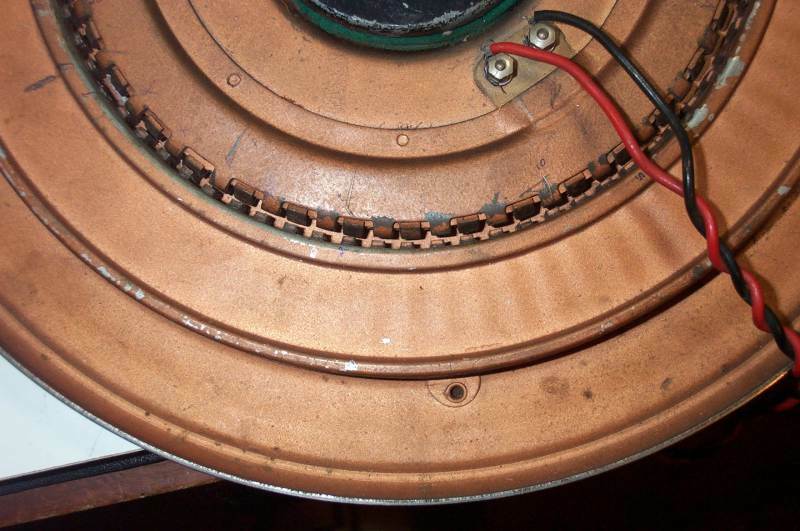 Inside the stator (between the gold-painted plates that end up as the fingers) is the coil of fine wire that is connected to the mains supply. The polepiece 'fingers' are made to be close to, but not touching, the magnets in the rotor when the two parts are put together. 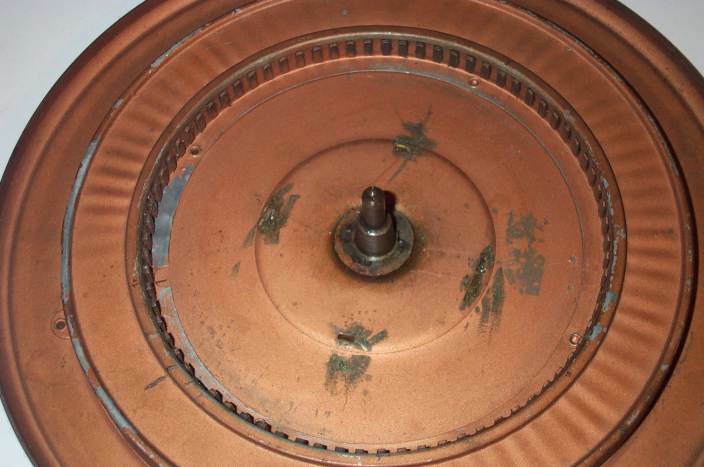 There are 76 polepieces on both the stator and the rotor. For 50 cycles per second mains, this gives a speed of 79 revolutions a minute, good for both 78 and 80 rpm records. 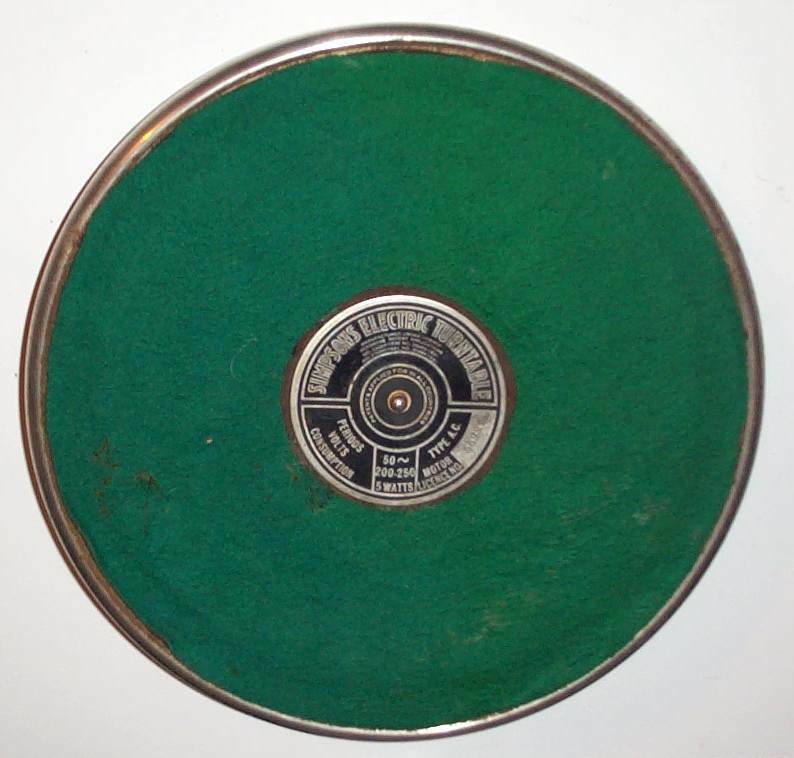 It is not possible to get 78 rpm exactly. 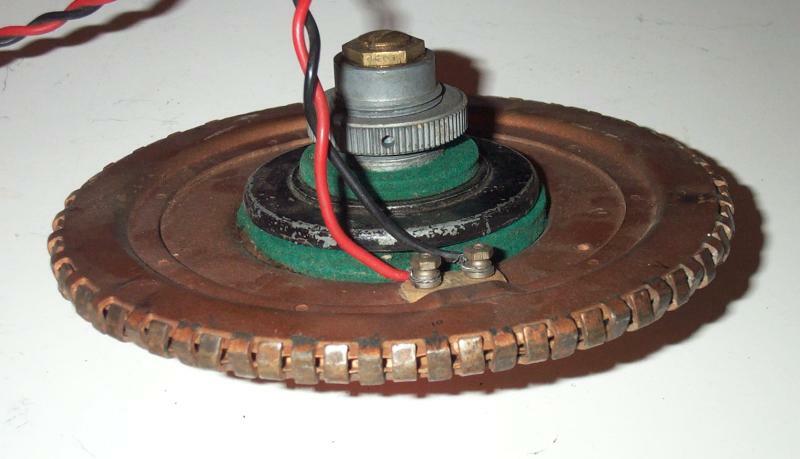 When the rotor (the turntable) is turning, it is at synchronous speed if the permanent magnets in the rotor keep always in line with the electromagnets in the stator that have the opposite magnetic polarity. That is, a North pole on the rotor moves to keep in line with a South pole on the stator. It will want to do this, because moving the other way, or moving too rapidly, will make it shift towards a like pole, North towards North for example. This will repel the poles and try to move them back into alignment with opposites. If the speed difference between the changing poles on the stator and the fixed poles on the rotor is too great, then before the rotor has moved into alignment the poles will have changed again. 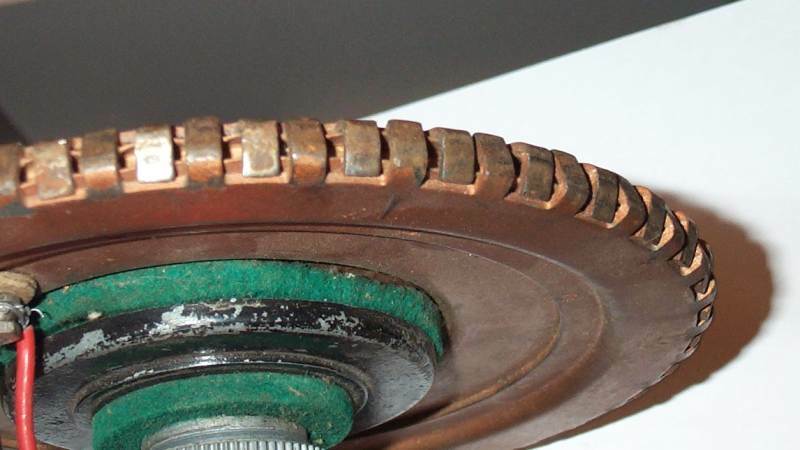 If this happens, the rotor will not synchronise with the alternating flux of the stator; it will be pulled and pushed first one way then the other. If the rotor was running too fast, it will gradually slow down (by friction) until it reaches synchronous speed and runs correctly. If, however, it was running too slowly, it will never reach synchronous speed and will eventually stop turning. Because of this inability to start itself, this synchronous turntable must be given a spin in the right direction to get it started. When it then slows down to 79 rpm it will run in synchronism unless there is too much friction for it to do so (perhaps due to dry bearings or a heavy pickup) and then it will slow down and stop. The interesting thing about this synchronous turntable is that it will either be running at exactly the right speed or not running at all. 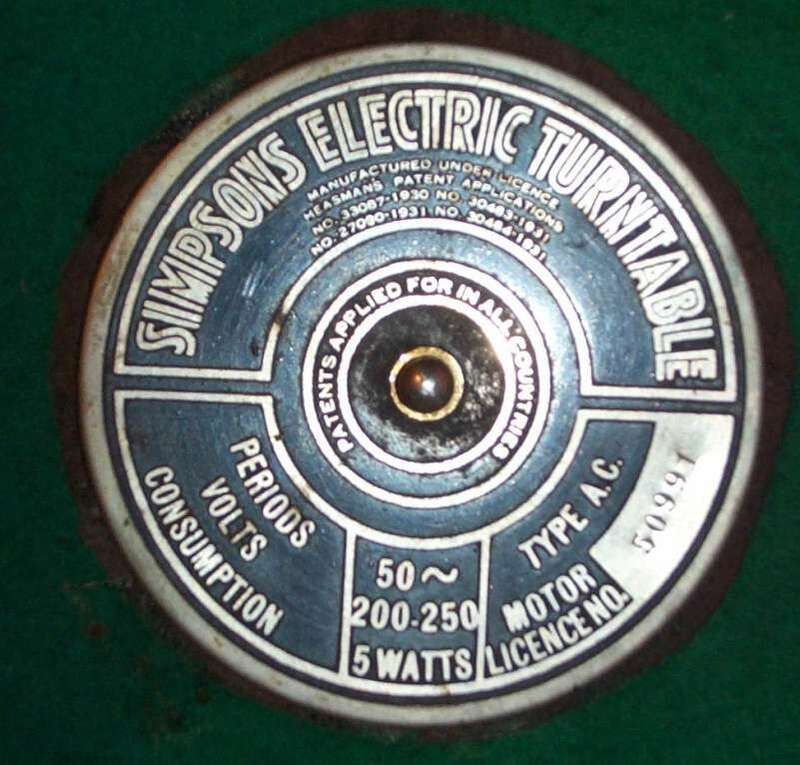 Modern electric turntables (like the Goldring-Lenco we mentioned before) are usually powered by an induction motor. This produces a turning force (torque) in one direction even when it is not turning at all, so it is self-starting; it always runs a little slower than synchronous speed, though, because it produces no torque at the synchronous speed. The difference is small, and is allowed for in the design, so it is not a real problem. Our turntable has another interesting (but not very useful) behaviour. There is nothing to determine the direction in which it must turn at synchronism, because there are matching poles equally in both directions. It will run just as well backwards as forwards! Some synchronous motors are fitted with a mechanical device that will stop them running backwards. 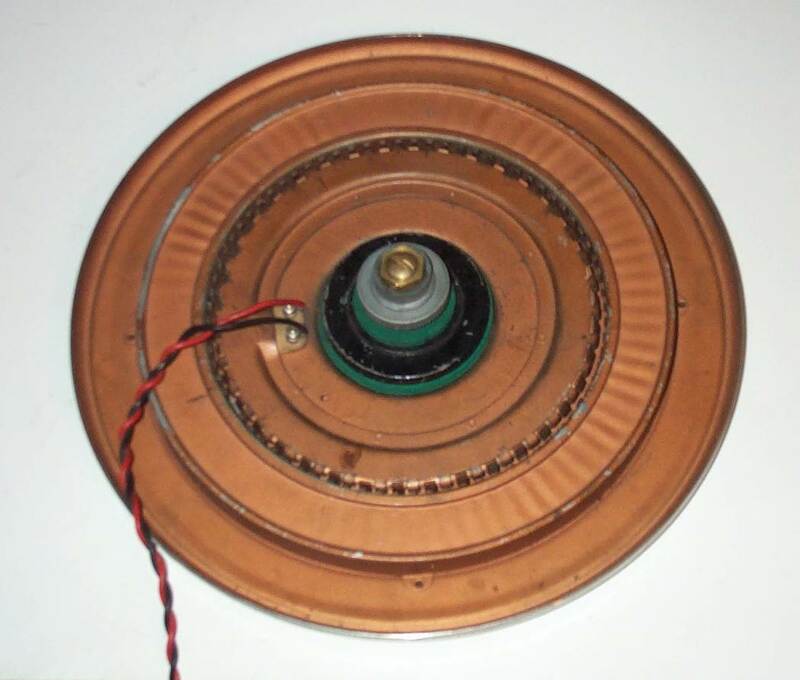 These can be found in electric clocks powered from the a.c. mains, where often the rotor is so light that it can start itself turning when power is applied.